Trim tougher ends off of asparagus bottoms. Wrap bundles of 3-4 pieces of asparagus with a slice of bacon. 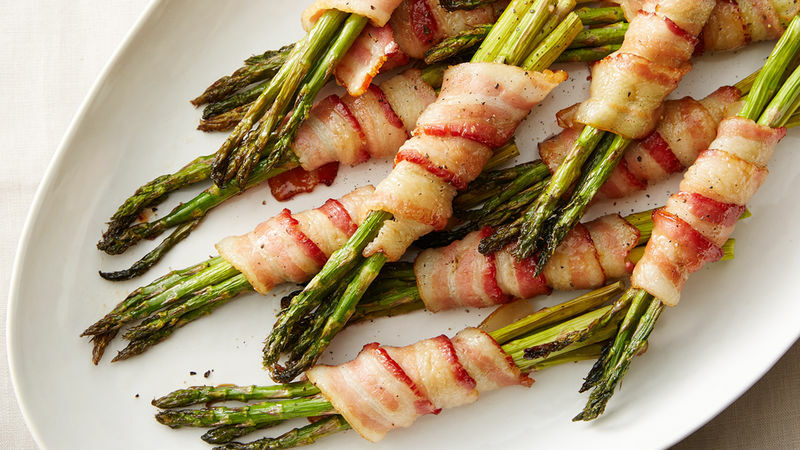 Place bacon-wrapped asparagus bundles into greased casserole dish. In a small sauce pan, melt butter and add brown sugar, soy sauce and garlic salt. Bring to a boil, stirring constantly. Pour brown sugar/butter mixture over asparagus bundles. As far as bacon-wrapped asparagus appetizers go, this one may include the extra step of grilling but it’s a step worth taking. Grilling the asparagus adds an incredible depth of flavor. Believe it or not, we have other ways to include asparagus in your meals that don’t include wrapping it in delicious bacon.